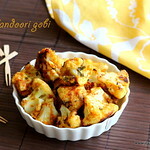 Tandoori Gobi is a very easy starter recipe which i recently saw in TV show, but i have never tasted this Tandoori Gobi. Last weekend, i ordered this easy starter recipe in a restaurant . Though we all liked the taste it was very spicy. 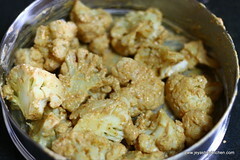 On the way back, i bought one pack of cauliflower to try this at home following the recipe. I tweaked the recipe slightly, according to my preference. 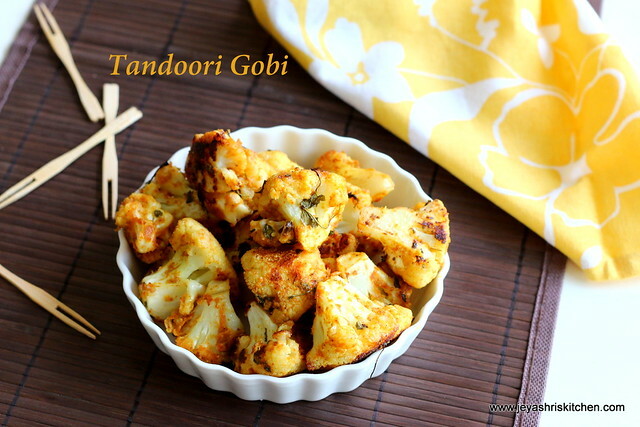 This tandoori gobi, turned out very well and we all happily enjoyed this vegetarian starter. 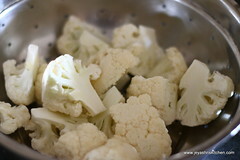 Cut the cauliflower florets into big. Put them in hot water and take it out in 2 minutes and drain the water. Hung the yogurt for 15 minutes to take out the excess water. You can also replace yogurt with sour cream too. 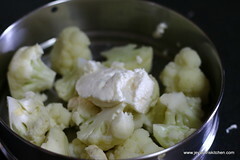 Put the blanched cauliflower in a wide bowl. Roast the besan in a low flame for 5 minutes. 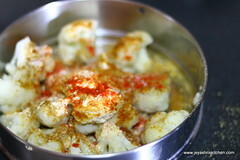 Add the red chilli powder, hund curd, salt, garam masala, cumin seed powder, coriander powder and kasoori methi. Mix well and keep it in the refrigerator for marination. Let this sit for 20 minutes. If you are baking grease a baking tray with little oil. 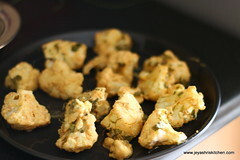 Spread the cauliflower florets in the baking tray and bake for 35 minutes or till they become golden brown. Turn the florets in between. I tried it on the tawa method too. Both turned out very well. 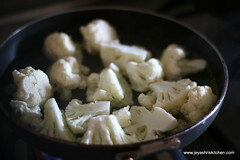 If using the tawa method, add few drops of oil on the pan, preferably a non stick pan. 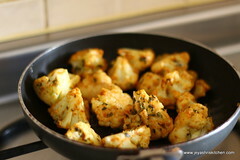 place the cauliflower florets on the tawa and slowly roast them till they turn golden brown. Turn the florets in between to get even browning. Always keep the flame low, else the florets will get burnt. 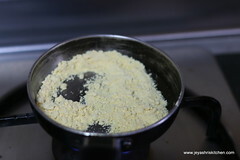 Sprinkle chaat masala just before serving. You can replace yogurt with sour cream available in the super market. You can also add tandoori masala for marination. This can be done in microwave too. Keep the marinated florets on a microwave safe bowl and cook till golden brown. Looks very tempting!! Lovely clicks as always..
looks yum! healthy starter for sure..
What temperature do we keep if using the baking oven. 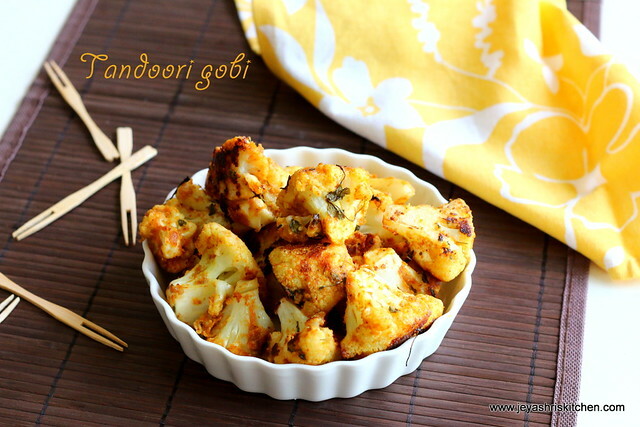 Gobi looks very tempting and delicious.. I love anyting vegetarian that begins with tandoori!!! I love the addition of chat masala. That must give it a very different taste Jey. 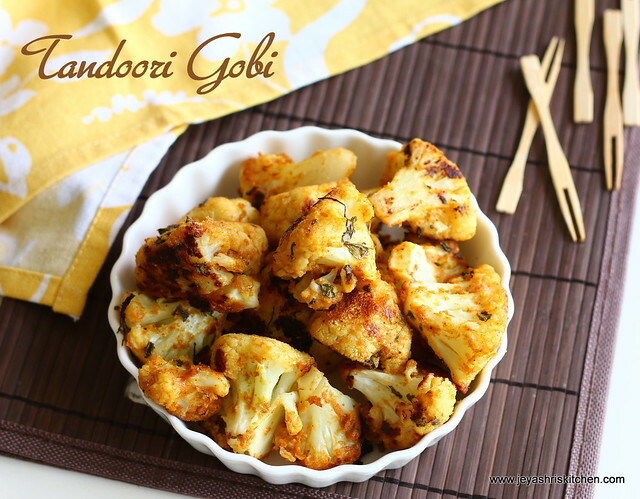 Also would make an excellent side dish for Rotis! Would love to have them as starters, soo tempting they are. At wat temperature u baked?